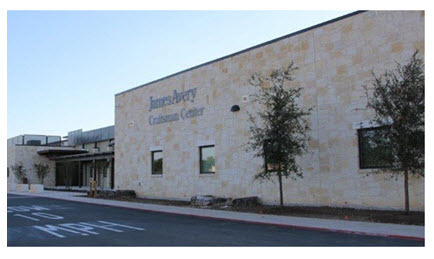 James Avery Craftsman Center glitz to Kerrville James Avery Craftsman Center glitz to Kerrville https://www.recenter.tamu.edu/news/newstalk-texas/?Item=15091 2016-11-15T06:00:00Z 2016-11-15T22:00:00Z ​​​​​​​ KERRVILLE, KERR COUNTY – Hill Country team members flowed into the 53,600-sf James Avery Craftsman Center for the first time to begin crafting the company’s iconic jewelry designs. 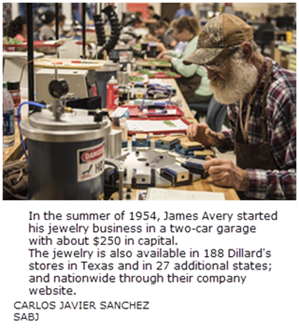 James Avery, a family-owned jewelry retailer, opened its new state-of-the-art Craftsman Center. The Center is located along the banks of the Guadalupe River on 30 acres just across from the Kerrville Municipal Airport on Hwy. 27. The company relocated 300 employees from its main Kerrville campus and current facility in Comfort, Texas to the new location. Listen to Podcast 323 for this story​.